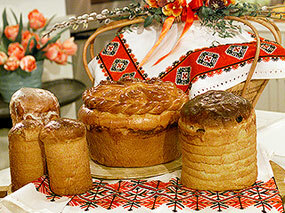 At New York's Ukranian Museum, learn crafting Pysanky! On the lower east side of NYC, just a couple of steps from Cooper Square lies a small museum dedicated to preserving Ukranian art & culture. When you first walk in you can see the permanent exhibit of Pysanky, Ukranian decorated Easter Eggs, on display. Each one an amazing piece of artwork created using batik techniques. If your curiosity takes you to their basement, past the folk art exhibit, in the back left-hand corner, you will find the classroom filled with students of all ages and nationalities learning the magic and beauty of making their own Pysanky. And if you are lucky enough you will also find other workshops like Ukrainian Bead Weaving called Gerdany, Traditional Ukrainian Embroidery which is mainly an array of cross stitches. Or one of their Holiday Traditions classes that feature hands-on samples of traditional food, bread and the customs that surround them. The arts of the Ukraine are strongly linked to their national identity and cultural heritage.The heart of the museum's education program is Maestro Lubow Wolynetz. Her embroidery classes always begin with the hefting of her super sized rolling suitcase full of traditional embroidery samples to inspire her students. Her class is so adored that students come from Boston or Pennsylvania on a weekly basis to take them. She is also in charge of the kitchen during the Holiday Traditions classes and happens to make the best potato salad ever! If you wish to indulge in a class, the prices are extremely reasonable, but it costs absolutely nothing to pop your head in to ask questions or say Hello! Look for similar products coming soon to our site at Global Shokunin!